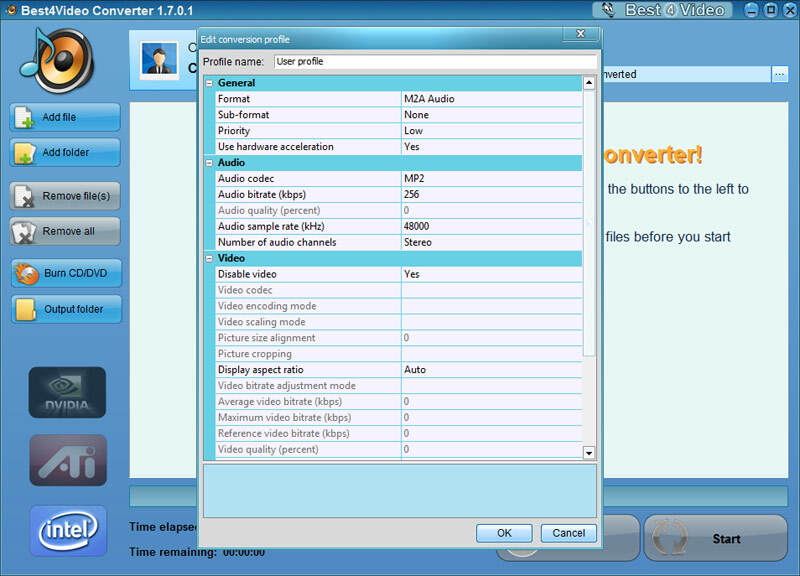 Best4Video Video to MP3 Converter is a perfect software to convert video files to MP3 audio format. With the help of this useful tool you will be able to extract audio from any video file and convert it to MP3 format to listen on your mobile phone, MP3 player, or any other portable device. Best4Video Video to MP3 Converter is a user friendly program with clear and intuitive interface which makes it extremely easy to use. 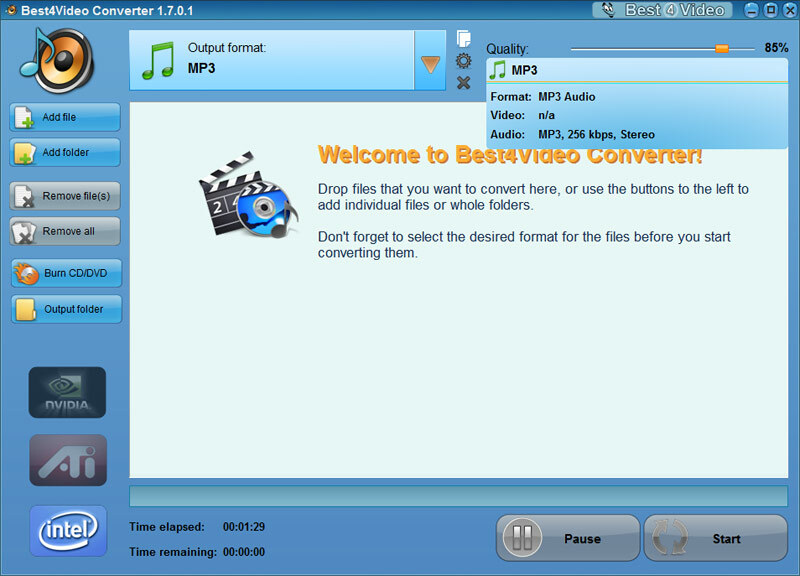 Any video to MP3 conversion can be performed with just a couple of mouse clicks, without a need for making any additional configurations — all you need to do is to choose MP3 as an output format, and Best4Video Video to MP3 Converter will do its best to let you enjoy audio tracks from your favorite videos anytime and anywhere. Extract audio from any video file and enjoy your favorite tracks on any portable device. 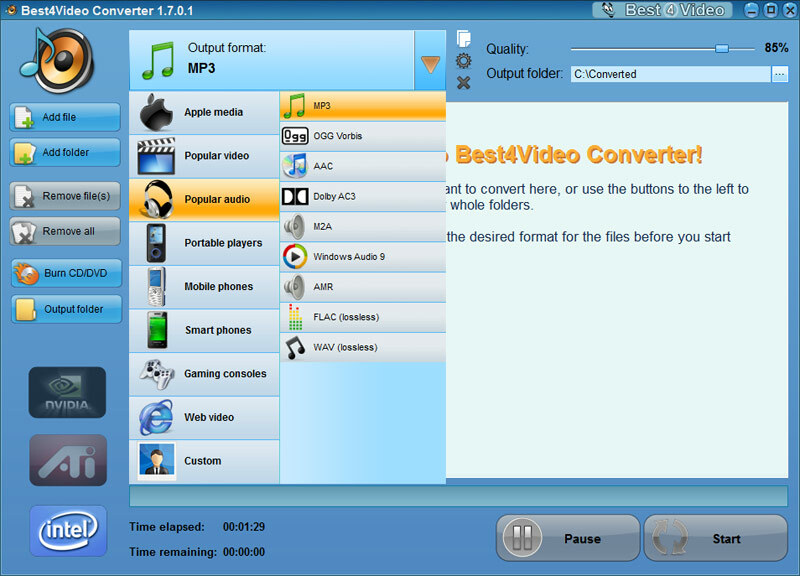 Convert all popular video formats, including FLV, AVI, VOB, MPG, MPEG, MPE, ASF, RM, WMV, OGM, MKV, MP4, SWF, TiVo, to MP3 format and listen to your favorite music without any limitations. Adjustable output settings for achieving best results: you can select audio bit rate in accordance with your own needs and preferences. Extremely fast conversion: Best4Video Video to MP3 Converter significantly saves your time, providing maximum possible conversion speed. Perfect quality: all video files are converted to MP3 format with perfect quality to ensure flawless playback on your favorite device. Batch conversion mode providing the ability to convert large video collections to MP3 format quickly and easily. User friendly software: easy to install and convenient to use. Conversions of any kind of video files to MP3 format are performed effortlessly with just a couple of mouse clicks. With the help of Best4Video Video to MP3 Converter you will easily extract audio tracks from any video files and convert them to MP3 format to enjoy without limitations on any audio device.